A short video interview with Aoba Miyazaki. 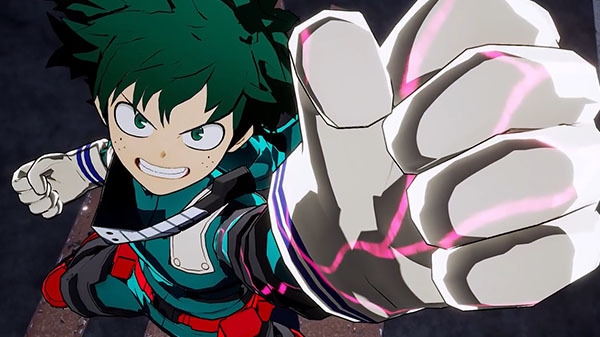 Bandai Namco has released a two-minute developer interview video with My Hero Academia: One’s Justice producer Aoba Miyazaki, who discusses the game’s multiplatform strategy, subtitle meaning, Izuku play style, and more. Hello, my name is Aoba Miyazaki, Game Producer on My Hero Game Project. In our first trailer, we revealed to the world that the game will be coming in 2018. In Japan, we announced that the game will launch on PS4 and Switch. However for the overseas, we have added two more platforms. And that is Xbox One and PC Digital. It is a challenge to work on all four platforms at once, but we’ve decided to do so in order to deliver this game to as many My Hero Academia fans as possible. While My Hero Academia follows the concept of Jump titles of Friendship, Effort and Victory, it has a lot of differences too. The clash between Heroes and Villains occur, only because they have their own beliefs and goals. I believe that’s what makes the fights so tense and appealing. I also believe that the appeal of the title comes from the fact that viewers can empathize with not only Izuku, but many other characters as well. In Japan, the Third Season of the anime has been announced, and the Weekly Jump episodes are also very exciting. 2018 will be a Plus Ultra year for My Hero Academia. And in order to share this excitement with the fans across the globe, we have decided to deliver this game to the fans overseas. As this title is a Fighting Action Game, we have first announced the two iconic characters from the Hero Side, and Villain Side. I hope you were able to feel their intense battle through the First Trailer. In terms of gameplay, Izuku is designed as a short-range power type, just like in the original works. We hope users will be able to experience exhilarating battles using his super human abilities. As for Shigaraki, we would like users to keep their eye on further information. Again in Japan, the Subtitle Name, “One’s Justice” has been announced. Through this name, we wanted to express the fact that each and every character that appear in My Hero Academia, have their own hopes, beliefs, and justice, and we hope to express this concept through the battle and gameplay as well. My Hero Academia: One’s Justice is due out for PlayStation 4, Xbox One, Switch, and PC worldwide in 2018. In Japan, it will only be released for PlayStation 4 and Switch.